Defining Russia Musically: Historical and Hermeneutical Essays. By Richard Taruskin. Princeton: Princeton University Press, 1997. xxxii, 561 pp. Notes. Index. Figures. Musical Examples. $49.50, hard bound. 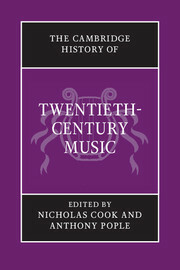 The Cambridge History of Twentieth-Century Music, first published in 2004, is an appraisal of the development of music in the twentieth century from the vantage-point of the twenty-first. This wide-ranging and eclectic book traces the progressive fragmentation of the European 'art' tradition, and its relocation as one tradition among many at the century's end. While the focus is on Western traditions, both 'art' and popular, these are situated within the context of world music, including a case study of the interaction of 'art' and traditional musics in post-colonial Africa. An international authorship brings a wide variety of approaches to music history, but the aim throughout is to set musical developments in the context of social, ideological, and technological change, and to understand reception and consumption as integral to the history of music. We have not even begun to tell the history of twentieth-century music. The Cambridge History of Twentieth-Century Music? What sort of a history of twentieth-century music might that be? The word ‘Cambridge’ is something more than a publisher’s imprint, for it locates this volume in a century-long tradition of Cambridge Histories and so emphasizes that this first large-scale, retrospective view of the twentieth century in music is a view from somewhere. As the title would lead you to expect, it is history written from a distinct and relatively homogeneous geographical, social, and cultural perspective: predominantly Anglo-American (though there are two authors from Germany and one each from South Africa and Australia), more male than female (gender representation in musicology, at least in the UK, remains far from equal), and white. That does not, of course, mean that our authors simply accept the traditional geographical, ethnic, and gender hierarchies of music history, for there is a strong revisionist strain in the book, one that attempts to contextualize and critique familiar narratives by juxtaposing them with alternative constructions of twentieth-century music. Like all historical writing, this Cambridge History is best understood as in essence a status report, a series of position statements in an ongoing dialogue, for no history can be more than a temporary stopping-point in a never-ending process of interpretation – which means that history is less a reflection of the facts than a construction of historians. What follows, then, is one particular set of constructions, the record of what a particular group of authors thought at a particular point in time. When one examines the earliest works of a great composer, it is almost Inevitably with hindsight that one does so. Hearing the earlier works through the portal that the later, more well-known works supply can be a strange experience, through which hindsight often hardens into self-reassurance. Does one hear a familiar foretaste of this here, a pre-echo of that there? Is there a discernible quality to the early works that is evident to us today, but which contemporary listeners seem to have overlooked? Such questions are easy to ask and carry a hint of smugness, but, conversely, is anything to be gained by turning the presumptions around – by dwelling, for example, on the ordinariness that allowed the composer's contemporaries to remain unaware of the genius in their midst? Surely not: for such inversion merely preserves the same impoverished agenda in negative. Questions of style impinge on the assessment of ‘early’ works in ways that demand examination in the present context. Consider the early works of Mozart as an alternative case to those of Stravinsky: as Charles Rosen has famously argued, the received idea of the ‘classical style’ is defined for us today by the mature works of Haydn, Mozart and Beethoven, rather than by the music of their many accomplished contemporaries. It is not that Mozart's music is recognised as similar to that of, say, J. C. Bach, Kozeluch and Kraus, and can be measured against it, revealing Mozart's ‘superiority’. This chapter deals with musical style and musical language around 1890, and discusses the distinction that may be drawn between the two. One of the century's most notable attempts to deploy musical language for culture-political ends dates from this time, with the declaration of the New German School. The chapter focuses on the varied florescence of styles and languages such as Don Juan, Pagliacci, the Variations on America, and En Saga. Debussy's mature music, beginning with the Prélude à l'Aprèsmidi d'un faune has frequently been seen as so innovative that it marked a new beginning. The chapter analyses the waves of innovation, which for each case has been represented by a composer who was successful at the time and whose works remain in the repertory. It also discusses the later reputations of Mahler and Sibelius, which far exceeded the extent of their public and critical success around 1900. Presenting a musical analysis of Tippett's Fantasia Concertante on a Theme of Corelli (1953), or of any other work for that matter, brings a number of discernible objects into juxtaposition. In particular, one musician's conception of the piece is set alongside its written score: the analyst's musical understanding is rationalised as explanations of how he or she comprehends certain passages, and these explanations are communicated through various verbal and graphical constructions around the score itself. In this process, the score is taken to represent a common ground between the author of the analysis and those who may read it; beyond this, further common ground is assumed in the shape of concepts from music theory which mediate (explicitly or otherwise) the analyst's introspections–whether these introspections be about the experience of reading the score, or about the experience of listening to a performance, or about the imaginary listening experience that often accompanies score-reading. The rather obvious objections that such experiences cannot literally have been shared, and that the concepts of music theory may not carry the same nuances of meaning for all parties involved, seem in general to be overridden by a belief that in practice there is a tangible communality that permits musicians to accomplish something in this way. The composer, too, is generally drawn into this network. Indeed, listeners may readily feel that they understand a musical work through some kind of empathy with the composer, a process of imagination to which explicit analysis is hardly essential. The Quatuor pour la fin du temps (Quartet for the End of Time) is among the best-known compositions by Olivier Messiaen (1908–92). 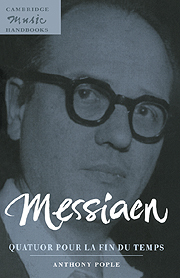 Like virtually all of his works, it combines the striking technical achievement of Messiaen's rich and attractive musical style with a deeply felt theological inspiration - in this case from the apocalyptic events described in the Book of Revelation, leading to the end of Time itself. Composed while Messiaen was a prisoner-of-war and premiered under extraordinary conditions in Stalag VIIIA in 1941, the work retains a powerful immediacy that has made it a favourite of performers and audiences alike. Anthony Pople's book provides an introduction to Messiaen's style through an examination of this great work, showing how it came to be composed and giving an in-depth assessment of each of its eight movements. Rhythmically the most characteristic piece of the set. The four instruments in unison are made to sound like gongs and trumpets (the first six trumpets of the apocalypse followed by various catastrophes, the trumpet of the seventh angel announcing the consummation of the mystery of God). The use of added values, augmented or diminished rhythms, and non-retrogradable rhythms. Music of stone, fearful granite sonorities; the irresistible movement of steel, enormous blocks of purple fury, of icy intoxication. Listen above all to the terrible fortissimo of the theme in augmentation and the changes in register of its different notes, towards the end of the piece. In this ‘dance of frenzy’, there is no harmony to soften the impact of the vigorous melody: all four instruments play the same line throughout – the piano in bare octaves and the others doubling as best they can. Only in the climactic passage near the end (vi/O:1 ff.) is this limitation briefly transcended as the full range of the piano is brought into play. Although Messiaen likens the extraordinary sonority of the four instruments in unison to the sound of gongs and the seven biblical trumpets, he perhaps wisely does not attempt to provide musical parallels to the ‘various catastrophes’ they announce. Instead, the powerful tension of the instrumental unison is presented as an analogue of these almost inconceivable events of judgement. There is a residual parallel nonetheless between the musical form and those passages of Revelation in which the sound of the trumpets is described. In the preface to La Nativité du Seigneur, and later in Technique, Messiaen describes and tabulates seven ‘modes of limited transposition’. These are pitch-class collections with properties of internal organisation that restrict the number of distinct transpositional levels of each collection to significantly fewer than the twelve that are available to most other collections, including the diatonic major scale. Each collection is itself generated by successive transpositions of a small cell of a few notes, giving a characteristic repertoire of melodic configurations, and each with the exception of modes 1 and 5 also contains a number of triads and/or other harmonies familiar from tonal music, something which Messiaen was able to exploit musically. The regular internal structure of the modes means that where one such harmony is found, others will be found at regular intervals from it, allowing the composer ‘[either] to give predominance to one of the tonalities or to leave the tonal impression unsettled’. For example, the form of mode 2 which contains the C major triad also includes the E♭ major, F# major and A major triads. The tonal focus might settle for a while on any one of these, or they might be cycled in quick succession. This mode, known elsewhere as the whole-tone scale, is entirely regular in construction, being generated by the six-fold transposition of a single note at successive intervals of two semitones (ic2). A scherzo of more superficial character than the other movements, but linked to them nonetheless by melodic reminiscences. It would surely have been unthinkable for Messiaen to have omitted from the Quatuor this unpretentious little movement, which was composed initially as a free-standing piece for his three fellow prisoners (see pp. 7–8). Nonetheless, both its title and the composer's programme note confirm, by their failure to make any mention of the apocalypse, that the ‘Intermède’ stands outside the orbit of what was to become the work's greater inspiration. If ‘Abîme des oiseaux’ presents a meditation on freedom and hope through an escape from ‘the equal and measured time of classical music’ and an invocation of birdsong, the ‘Intermède’ is escapist in a contrasting way: it evades through its musical lightheartedness the sombre if uplifting reflections that occupy the remainder of the Quatuor. It does this in an exactly contrasting way, through its conspicuous use of regular rhythms and phrasing; and also – whilst it makes considerable use of Messiaen's modes – through its clear tonal orientation and formal layout. The first and third sections (very short) evoke the power of the mighty Angel, crowned with a rainbow and clothed by a cloud, who sets one foot upon the sea and one foot upon the earth. In the middle section – these are the impalpable harmonies of heaven. On the piano, gentle cascades of blue-orange chords, garlanding with their distant carillon the quasi-plainsong chanting of the violin and cello. A vocalise – Rachmaninov's for soprano and piano (1912) is a famous example – is essentially a song without words. It is not an instrumental composition, however, as are Mendelssohn's Lieder ohne Worte, but a wordless song for a singer. So, as in the case of the contact between nature and Heaven effected in ‘Liturgie de cristal’, Messiaen's use of the term vocalise here seeks to perform an act of identification. The song in this second movement ‘is’ a song for the Angel, though what we hear are the instruments of the Quatuor. As Messiaen's prefatory remarks explain, the movement falls into three main sections. This large-scale articulation, which immediately distinguishes the ‘Vocalise …’ from the manner of the first movement, is made crystal clear by the tempo markings in the score. The first part begins in the modéré tempo of the previous movement, but is here additionally marked robuste in reflection of the musical character; after two bars comes a virtual doubling of the notated tempo (presque vif, joyeuxy = c. 104), and these two tempi continue to alternate, ending with the presque vif at ii/C.1–2 and the modéré at C:3–7. although it may be no great distance … from seeing water as a ‘symbol of Grace and Eternity’ in Fête des belles eaux to conceiving the same music as illustrative of the ‘Eternity of Jesus’, the introduction of the Word can scarcely be dismissed as insignificant. Clarinet solo. The abyss is Time, with its sorrows and its weariness. The birds are the opposite of Time; they are our desire for light, for stars, for rainbows and joyful songs! [v. 1:] And the fifth angel sounded, and I saw a star fall from heaven unto the earth: and to him was given the key of the bottomless pit. [v. 2:] And he opened the bottomless pit; and there arose a smoke out of the pit … [v. 3:] And there came out of the smoke locusts upon the earth: and unto them was given power … [v. 4:] And it was commanded them that they should not hurt the grass of the earth, neither any green thing, neither any tree; but only those men which have not the seal of God in their foreheads, [v. 5:] And to them it was given that they should not kill them, but that they should be tormented five months … [v. 6] And in those days shall men seek death, and shall not find it; and shall desire to die, and death shall flee from them.